The NCAA Tournament’s round of 16 teams is deemed sweet for good reason: it’s when the matchups heat up. Gone are the pretenders, the double digit seeds biting at the ankles of favorites, the one-round wonders and the beneficiaries of easy paths. The Sweet Sixteen is very often the first chance to see matchups between legitimate contenders. 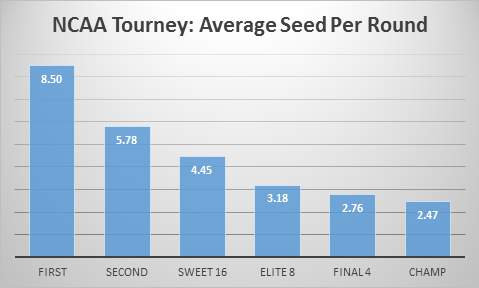 To pay the round respect, I’ve decided to take a (mildly) statistical look at it by measuring the jump in average seed between rounds to see whether the Sweet Sixteen truly is the first great round. The result is that the marginal drop-off between rounds is generally smaller as the tournament goes on. 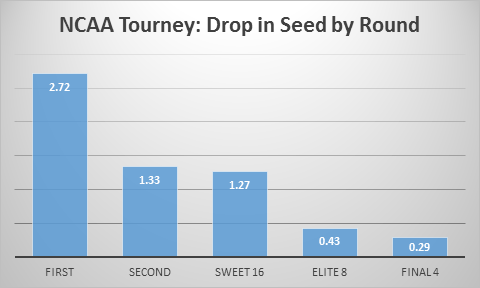 This makes intuitive sense, as there are much higher seed numbers to work with in the first round; 16-seeds going down in the opening round will lower the average more than is possible in the Final Four. The second round, you’ll note, features a drop-off that is much lower than the opening round but not much higher than the round of 16. This deflates the idea that the Sweet Sixteen is the round in which the matchups are drastically improved. After all, the calculation carries forward, so a large drop-off in one round means the seeds are much better in the next. Still, it’s hard not to be romantic about a round that’s given us Danny Ainge’s layup, Rip Hamilton’s off-balance buzzer-beater, and Tate George’s fadeaway. Each year, the growth is not really equal .